I clocked 5 hours on the piano today. “Did you get a buzz from performing?” I asked an amateur guitarist who gave a concert on his 50th birthday in Amsterdam. Inspired by our morning phone conversation, I walked eagerly to my piano. There, piled in separate stacks lay the sheet music for piano and French horn, guitar, flute, and bassoon. My new chamber music repertoire for 2010 sat idle for the past few weeks when I had been traveling abroad. It was 11:30 am when I started playing. I played until 1 pm and reluctantly got up to cook lunch for four people. Anything that interfered with the “flow” was an interruption. After cooking, eating, and cleaning, I resumed playing at 2:45 pm. Even an accidental cut to my middle finger (from cleaning a sharp knife) didn’t stop me. Was it lightning that flashed outside? Thunder that shook the house? And rain that spewed through the front door? Once I started playing, I couldn’t stop. My fingers glided over the keys. My ears swooned in the romantic music of Strauss, Saint-Saens, and Schumann. I was alone in my music, totally absorbed and relaxed. At 6:15 pm I had to stop. The evening aerobics class that I had so looked forward to was now an interruption. I clocked five hours on the piano today. Tomorrow I shall get up earlier than today, to squeeze an hour of playing before my morning yoga class. But the afternoon will be interrupted by a one hour piano lesson. And sadly there will be only three hours left before I cycle to my Rotary Club dinner in central Utrecht. Not enough time for a pianist on a roll…..
What ignited this passion? Could it be the three hours I had on a Yamaha grand in an apartment near the Finnish beach? 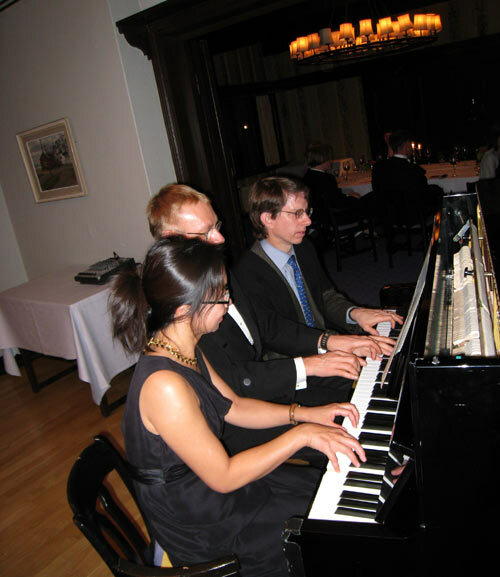 Or sightreading with two professors at the Helsinki Hilton (below) at a doctoral dinner party? Thanks for the comments. Indeed music can be addictive and also calming like a cure to the stresses of daily life. I wonder what live music does to a gathering — does it ignite it, inspire more meaningful conversation, etc. What’s the difference between live foreground music where we have to sit quietly and listen (e.g. a concert) versus live background music (where hopefully it doesn’t intrude but gives us the liberty to just “be”) …. These are all thoughts as I try to find as much time between other chores and commitments to practise the piano.